I've been on a cookie making kick lately. I don't think my co-workers are complaining...they've been reaping the benefits! When I was house-sitting for my parents earlier in September, I rummaged through their pantry to see what I could bake. I was pretty limited, but they did have a box of cake mix, chocolate chips, and peanut butter chips. My roommate in college used to always make cookies from a box of cake mix, so I Googled the recipe and they turned out really good! Mix all ingredients. Using a tablespoon, drop cookie dough onto an ungreased baking sheet. Bake at 350 for 7-8 minutes. I prefer mine a little undercooked, because they get firmer once they cool. I was on the search for Nestle Pumpkin Spice baking chips this season, but couldn't find any at Target or Kroger. Not many stores carry this limited-edition flavor, so I broke down and ordered them on Amazon. They were twice as expensive as a normal bag of chocolate chips ($9/bag on Amazon), but I desperately wanted to try them, so I splurged. I used the cookie recipe on the back of the bag, and I think they turned out great. 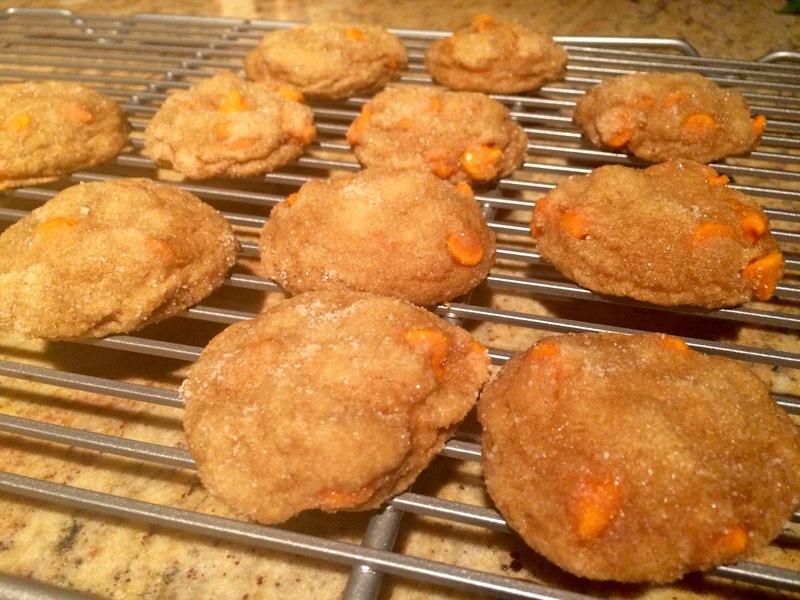 They really taste like a cookie version of pumpkin pie! The pumpkin spice chips would also be good in the cake batter cookie recipe. I think I'll experiment with that next!